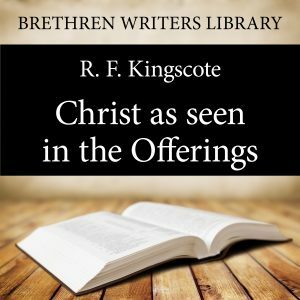 Christ as seen in the Offerings is a classic work by RF Kingscote which takes up in a simple way some of the offerings mentioned in Leviticus – a book which is commonly passed over as if it were not relevant to us today, but which is full of rich typical teaching. The author expounds very clearly the meaning of the offerings which are brought before us, which are types or pictures given by the Holy Spirit of the Lord Jesus Christ's Person and work and of what results to us through that work which has much relevance to us today. Illustrating various truths of the gospel, the author helps us to understand the sweet savor offerings and the sin offerings and encourages us to appreciate more deeply the magnitude, the meaning & the gloriousness of the Lord Jesus Christ’s sinless life and finished work. Capt. Kingscote was in the Royal Lancers, but on his conversion he left the Army. He was a great friend of the late Duke of Cambridge, the cousin of Queen Victoria. He was the writer of several tracts and pamphlets, “Christ as Seen in the Offerings,” is based on a series of addresses given by him at Park Street, London, which was printed and published in one volume, and has helped many over the years.